Have you ever been really hungry for a quick meal but didn’t want to cook? Well that was where I found myself. As my eyes darted around the kitchen for a meal to magically appear, the red and orange tomatoes I bought jumped out at me. Hmmm, I’ve not had a BLT in a long time. There was a period of time where I couldn’t eat tomatoes. But now I can as long as it’s on a 4 day rotation. I had made bacon this morning for breakfast so I had some left in the refrigerator. I also had picked up romaine lettuce at the same farmers market where the tomatoes came from. Excellent! I really like to add avocado to these sandwiches. They call that a BLAT. But I had used all of my avocados last night for guacamole. So I was going to make a BLGT. Or is it a BLTG, GLBT, LGBT, or TBLG? BLAT sounds funny, what does BLGT sound like? Anyway, I was really hungry so I got busy making my sandwich. Toasting gluten free bread is key. I’m still working on learning how to make gluten free bread turn out to look like a loaf of bread in my bread machine. For now we eat Glutino’s Flax Seed or Corn bread. It works for everyone in my family. Start by spreading the guacamole on both slices of bread. Then layer your lettuce, tomato and bacon. I like to salt my tomatoes a little with Celtic Sea Salt. Carefully put both sides together. You can use toothpicks to hold it together until you’re ready to eat. Whatever you do, don’t cut it in half. The sandwich was delicious. It was so good I’ve had it twice in one week. The guacamole added the glue to kind of hold things in the sandwich and added great flavor. Here’s a tip. Once you pick up this sandwich and begin to eat it, don’t put it down. It can be messy and it will fall apart if you let go. But don’t worry, it’s finger licking good. For the vegetarian version of this sandwich leave out the bacon. I served this to my son and he thought it tasted great, just messy. So, what do you add to your BLT and what do you call it? For more glute free meals, visit What’s For Dinner Wednesday at the Gluten Free Homemaker. Hmm, too hungry and not wanting to cook? Just five or six times a week 🙂 That looks great, I love using avocado in place of mayo. Alisa- Glad I'm not alone out there. I'm always looking for ideas to change out ingredients for what I have on hand while keeping it gluten and dairy free. Thanks for stopping by! Alisa- Glad I’m not alone out there. I’m always looking for ideas to change out ingredients for what I have on hand while keeping it gluten and dairy free. Thanks for stopping by! Stephanie- Thank you. It's fun to try and pronounce the abbreviations. Stephanie- Thank you. It’s fun to try and pronounce the abbreviations. I love it with just mayo, bacon, and lettuce. (I don't eat raw tomatoes.) I haven't thought about having on in a while though. Thanks for the idea. Now I'm really hungry. Linda- My husband will only eat raw tomatoes if I hide them or salsa. Is it a texture or taste issue? For him I think it's texture. We all have our rules and so we should. 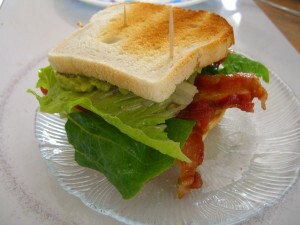 I love it with just mayo, bacon, and lettuce. (I don’t eat raw tomatoes.) I haven’t thought about having on in a while though. Thanks for the idea. Now I’m really hungry. Linda- My husband will only eat raw tomatoes if I hide them or salsa. Is it a texture or taste issue? For him I think it’s texture. We all have our rules and so we should. Yum! I like your commentary 🙂 Also the new site looks nice I'm adding you to my blog roll, I didn't realize I hadn't already! Good call sending out the email. Yum! I like your commentary 🙂 Also the new site looks nice I’m adding you to my blog roll, I didn’t realize I hadn’t already! Good call sending out the email. Hmmm, I posted a comment the other day and it's not here. Those blog gremlins are so annoying! What a wonderful sandwich, Diane. I loved the part where you said not to put it down … who would want to put a sandwich this good down? Hmmm, I posted a comment the other day and it’s not here. Those blog gremlins are so annoying! Great pictures! 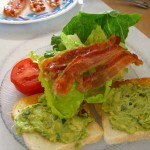 I love a good BLT, but I have never tried it with guacamole. Looks delicious. Brian- Thank you for the compliment. My poor family just sits and waits as I take photos of our meals. Clearing the deck so stray things are out of the photos. Do you guys eat a lot of sandwiches at the firehouse? We should do a series on sandwiches for the summer. Great meals in sandwiches but you need to get creative when it's gluten free and dairy free. Brian- Thank you for the compliment. My poor family just sits and waits as I take photos of our meals. Clearing the deck so stray things are out of the photos. Do you guys eat a lot of sandwiches at the firehouse? We should do a series on sandwiches for the summer. Great meals in sandwiches but you need to get creative when it’s gluten free and dairy free.